Citation: Wortley D. Impact of digital technologies on public health policy and planning. J Public Health Policy Plann. 2017; 1(1):18-19. Copyright: © 2017 Wortley D. This is an open-access article distributed under the terms of the Creative Commons Attribution License, which permits unrestricted use, distribution, and reproduction in any medium, provided the original author and source are credited. We live in a paradoxical society in which rapid advances in emerging digital technologies are contributing to improvements in clinical outcomes and extended longevity. Our understanding of and ability to diagnose and treat medical conditions has shifted the primary causes of morbidity away from infectious diseases towards lifestyle-related conditions such as Diabetes, cancer, pulmonary and cardiovascular problems. Complicating the situation is the recognition and awareness that the antibiotics we have developed to treat many of the medical challenges of the 21st century are themselves, through mutation, creating a potential doomsday scenario in which new viruses will emerge which are resistant to treatment and could cause mass fatalities, especially in the modern world where global transport is so affordable and accessible. This article looks at the challenges to the future of humanity posed by advances in digital technologies such as artificial intelligence, cloud computing, robotics, machine learning and social media. It makes an argument for the need to shift attention away from the holy grail of universal medical cures and preventions towards greater citizen engagement and responsibility for personal health management assisted, where relevant, by digital technologies. 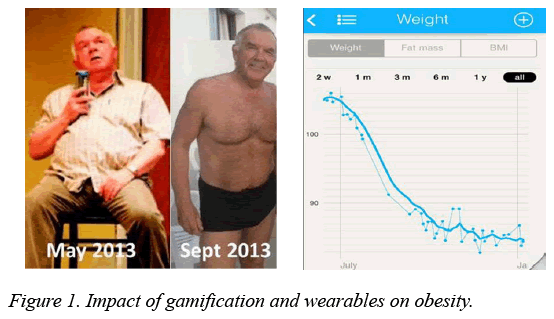 Figure 1: Impact of gamification and wearables on obesity. Many of today’s key medical challenges are attributed to sedentary lifestyles. Technology has played an important part in this societal phenomenon, partly through the automation of many industries where physical labour has traditionally been required and partly through developments in digital media, communications and computing which have made access to home entertainment and the routines of daily life so much easier that the physical and cognitive demands on citizens in the developed world are a fraction of what previous generation have been used to. As a consequence, although daily life does not wear out today’s bodies and minds in the same way, coming generations will enter a world which is very different to that of half a century ago and it is likely to be a world in which so many tasks and jobs are taken care of by robots and machines than human beings face the problem of not having the daily challenges and incentives which come from everyday life and which are responsible for our learning and development and are what shapes us as individuals. The net result of these trends, I would argue, is the emergence of the “Spectator Society” in which the locus of control is shifting from internal (in which we believe we have some control over our lives) to external (in which we have no control over or responsibility for what happens). The implications of this for public health policy are profound and I believe that it is imperative that measures are put in place to address the situation in order to protect the future of humanity. There are a number of different approaches to solving the public health challenges of today. These are just a few Generic Alternatives. Massive amounts of both public and private funding are already being invested in R&D to find solutions for the prevention, early diagnosis, treatment and management of the main causes of morbidity and the cost burden of lifestyle related conditions. The attraction of having a simple and cheap way of preventing and/or protecting us from the consequences of our lifestyle behaviours is very attractive to both policy makers and citizens alike because, if such solutions could be developed, they would not only save public funding but they would also allow us to freely choose lifestyles without fear of the consequences . Another solution which is often demanded by the public is legislation designed to discourage or limit those lifestyle elements which adversely affect our health. Examples include taxation and advertising restrictions on cigarettes and alcohol and the imposition of strict rules on the sugar content of food and drinks. This public health strategy is designed to protect citizens from the consequences of their lifestyle choices but is less popular with the industries which feed these markets . Educating citizens, especially at the earliest possible age, of healthy lifestyle choices and funding programmes designed to encourage positive lifestyle choices is another option which is already in use. The hope is that healthy behaviours and lifestyle choices at an early age will persist across citizen lifetimes and prevent the emergence of medical problems later in life . A more contentious health policy strategy is the linking of health insurance to lifestyle behaviours using digital technologies such as wearable devices to track physical activity and health parameters. This approach is already being used for motor insurance where drivers who can demonstrate good driving practices through installed sensor devices and applications are rewarded by reduced premiums and other incentives. Although there will be strong opposition to this being applied to public health because of the dangers of penalising citizens with pre-existing or hereditary conditions, there is little doubt that this solution will become more significant in future public health policies. The final public health policy option which I would like to argue for as an essential strategy for protecting the future of humanity is based on a Citizen Charter for Personal Health Management supported by digital health technologies. The idea of this charter which would be a signed contract between citizens and Government/Society in which the citizen agrees to monitor and collect their own personal health data for sharing anonymously with public health services in exchange for personalised advice on health management and other healthcare benefits. The argument for such a contract is that the agreement does not force or oblige the citizen to adopt a healthy lifestyle (although I believe this would be an automatic outcome) but it does provide public health policy makes and medical researchers with invaluable data for strategic decision making and the effective direction of funding and resources into the most important areas. Mesmar S, Talhouk R, Akik C, et al. The impact of digital technology on health of populations affected by humanitarian crises: Recent innovations and current gaps. J Public Health Policy. 2016;37(2):167-200. Hicks ER. Digital citizenship and health promotion programs: The power of knowing. Health Promot Pract. 2016;3. Zimlichman E, Rozenblum R, Salzberg CA, et al. Lessons from the Canadian national health information technology plan for the United States: Opinions of key Canadian experts. J Am Med Inform Assoc. 2012;19(3):453-9.